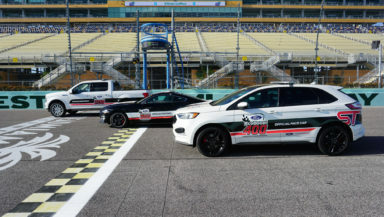 Three high-profile Ford vehicles will be on display pacing the field during Ford Championship Weekend at Homestead Miami Speedway. The All-New Edge ST, along with the best-selling Ford-F-150 and Bullitt Mustang will each serve as pace vehicle for one race this weekend. This marks the 17th consecutive year Ford Championship Weekend has served as the event where NASCAR crowns champions in its three highest touring divisions. DEARBORN, Mich., Nov. 13, 2018 – Three high-profile Ford vehicles – Edge ST, F-150 and Bullitt Mustang – will be pacing the field in different events during Ford Championship Weekend as NASCAR crowns champions in its three highest profile series. Ford drivers Joey Logano and Kevin Harvick will look to deliver the NASCAR Monster Energy Cup Series championship while Cole Custer has an opportunity to capture the NASCAR XFINITY Series title in separate races Saturday and Sunday. The iconic Ford F-150, which has been the best-selling pickup truck in North America 41 years in a row, will start the weekend at Homestead-Miami Speedway by pacing the Ford EcoBoost 200 on Friday night while the famous Bullitt Mustang will lead the field to green for Saturday’s Ford EcoBoost 300. The all-new Edge ST will cap the weekend on Sunday as the Monster Energy NASCAR Cup Series crowns its champion in the Ford EcoBoost 400. Ford has been serving as the season finale sponsor for all three championship events since 2002.